Word Art Wednesday Challenge # 192 - Anything Goes! It is Wednesday and time to check in at Word Art Wednesday for a mid week Bible devotion from Karen Letchworth , a free scripture from Karen Murray for your collection. Every week there is a new opportunity to share your Art, your Heart and maybe even win a prize!! The first time I read that verse it made me feel so happy, If the trees of the field and the hills and the mountains could physically respond to the to the presence of the Lord, than how could I not! In my mind I saw those tress clapping and every time I read this verse I still when all of creation will rejoice!! 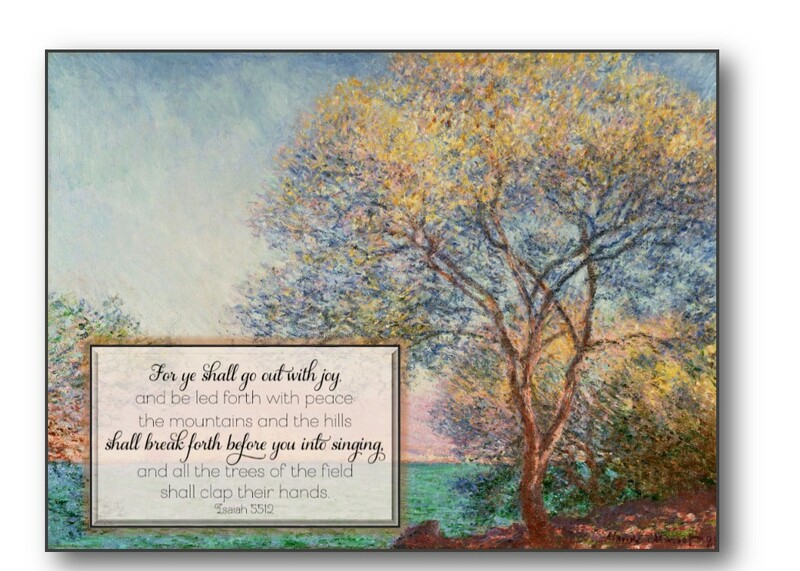 I created a hybrid card using a wonderful Monet painting! I added clear gel medium to create brush strokes on the tree. Thanks for stopping by and I hope to see your entry over at Word Art Wednesday! This is beautiful! What a great idea for a hybrid card- it goes perfect with the sentiment! This is a beautiful card, Ginny. I love the blues with the gold foil. Very pretty and serene. Beautiful!! Love the additions and elements you've added to your card! God bless! Just stunning, very inspiring !!!! Wow, this is so perfect a picture for the verse. Very nicely done!